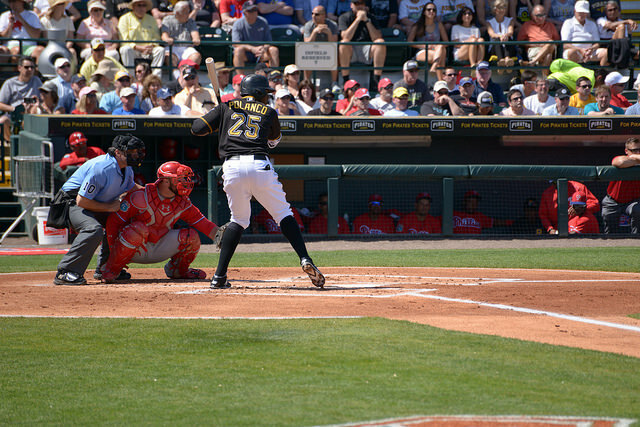 Gregory Polanco has a new extension, and looks like a new hitter. After a pair of frustrating losses to split the series with the Brewers, the Pirates come to town on Monday for a three-game series. The Pirates had an amazing run last season, despite the quick exit from the playoffs, and did only minor remodeling in the offseason. The biggest loss was unquestionably A.J. Burnett out of their rotation, but they shored up that spot with Jon Niese, and replaced Pedro Alvarez at first base with one of my favorite low-key signings of the offseason in John Jaso. Despite only a tepid early-season performance from Andrew McCutchen, the Pirate offense has been spectacular thus far, and their fielding (by UZR, anyway) has been top-drawer. But their pitching has struggled, particularly in their bullpen, and it's kept them well shy of the ridiculous pace the Cubs have established in the NL Central. They'll have a long road to climb over the rest of the season if they're going to avoid another wild card game. Even as-is, they have a one in three chance of making the playoffs at all. It's early, but this is a team that will have to improve on the run-prevention side of things if they want to repeat last year's success. With the Reds thoroughly out of it, and given my fandom of their front office, I'll be cheering for the Pirates to win this year...anytime they don't play the Reds, of course. Brandon Phillips had himself a monstrous series against the Brewers, and launched himself from a 75 wRC+ mid-last week to the second-best tally on the team. I question how many more times he can go down on his back knee to successfully jerk a ball over the fence, but it was fun to see him smashing the ball around. Adam Duvall also got himself north of the average mark thanks to a series of home runs. He doesn't walk much, strikes out a lot, and is the most pull-oriented Reds hitter right now, but he has nevertheless been a pleasant surprise. The Reds demoted Scott Schebler today and replaced him with another lefty-hitting outfielder in Kyle Waldrop. I'd guess a big part of the reason was to get Schebler some PA's. The plan coming into the season was to platoon him with Duvall in left field, but that plan quickly faded as Duvall carried his hot spring over into a full-time role. Waldrop, prior to a miserable showing at AAA Louisville last year, had been on the prospect radar. His performance had usually exceeded scouts' assessments of his future, and so perhaps his struggles were foretold. This year, while his hitting line isn't particularly inspiring (0.228/0.294/0.380), it's good for a 98 wRC+. Offense must be hard to come by in the International League thus far. Waldrop offers power potential, but not much else. I'd expect him to be used primarily as a pinch hitter against righties. I certainly hope he won't play anywhere but a corner. The Pirates' offense is off to one heck of a start to the season. Remember all the hoopla about the Royals and their contact-oriented offense last year? The Pirates don't strike out either. Well, Andrew McCutchen does, but he's awesome so who cares? They have some free swingers on the squad as well in Josh Harrison and Starling Marte, but both guys have power and defensive virtues (Harrison is versatile, Marte is a center fielder playing in the Pirates' deep corner). Jung-Ho Kang just returned from the DL after his slide-induced injury last season, but even while he was away the Pirates got a nice performance from veteran David Freese. Now, they've got Freese's bat playing off the bench, and platooning with John Jaso at first base against lefties. Word is that Kang will be worked back slowly, so we may still see Freese start a game at third base this week. The decision to sign Gregory Polanco to an extension is looking pretty good in the early-goings. While his defense and baserunning allowed him to turn in a good first season in 2015, he's been smoking hot this year as their #3 hitter. I haven't looked at his ground-ball splits, but he also looks like a prime candidate to shift against given his pull rates. McCutchen has been moved up to the #2-slot in the Pirates' ongoing efforts to optimize their team at the margins using a data-driven approach. Sigh. Jon Niese seemed like a revelation pitching out of the Mets bullpen last season, but thus far he hasn't looked particularly sharp back in a starting role. He does get ground balls, per the Pirates' philosophy, but he hasn't been able to do a lot else so far. Juan Nicasio really looks to have turned his career around (based on the early small sample). Coming up in the Rockies system, Nicasio wasn't a top-tier prospect, but he boasted excellent strikeout numbers and good velocity. I've always liked him, and was happy to hear he'd won a spot in the Pirates rotation out of spring training. He's been pitching out of his mind thus far. Two starts in, Tim Adleman certainly is showing some warning signs. The .185 BABIP. The 98% LOB%. 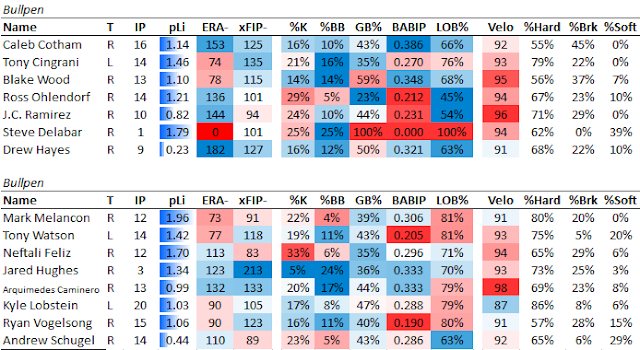 But despite all that, his xFIP is the second-best of any Reds starter this year. Keep doing that weird delivery, Tim. I'll be cheering for it to keep working. J.C. Ramirez is now the only Reds releiver to have a better-than-average xFIP. xFIP doesn't know he gave up that homer, of course, but it's been good to see him striking guys out and pumping in the heat. Looks to me like a keeper, as far as middle relievers go anyway. The Pirates usually have an outstanding pen, but they've struggled in the early season. Tony Watson and Arquimedes Caminero just haven't been anything like their typical selves, and Jared Hughes has barely pitched. 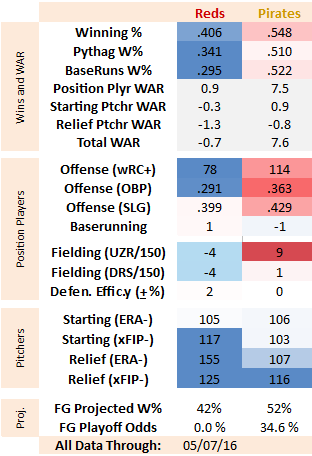 Neftali Feliz is another one of their reclamation projects, and looks like a smart signing thus far. He's been dealing, and I was shocked to see that he's still just 28 years old. Rain is in the forecast each of the next three days in Cincinnati, but the weather looks to be warm. Take some steamy nights (for May! ), two struggling pitching staffs, and an explosive Pirates offense, and you have a recipe for some high-scoring games at Great American Ballpark. Go Reds!